I am a big fan of Kohl's. In 20 years they've risen from just 66 to more than 1,000 stores. Since the beginning of the decade, their stock has outperformed competitors', increasing 28% to Target's 6% and Wal-Mart's decrease of 28%. And, they've demonstrated a very admirable commitment to our environment, having recently been named by the EPA as the number one purchaser of green power among retailers. Plus, I like their stores and apparel! So if I "expect great things" from Kohl's, it's only because they themselves have set the bar so high. This is why I was disappointed to learn about the lack of transparency exhibited by one of their marketing executives and an agency exec on Kohl's Facebook Fan page. Based on his activities in Kohl's Facebook community, Ed Gawronski seems to be a big fan of Kohl's. Two weeks ago he noted, "Less then 4 hours to get a great deal at Kohls.com. I just hit the jackpot and saved 30% on some ASICS sneaks. Cost me almost nothing." And a couple days later he had another scoop for Kohl's Facebook Fans: "make sure to give your email to kohls.com. I think they give you $5 when you give it in. The deals get even better too. I've seen special online promotions every week." You might think Ed is just a helpful guy and a big supporter of Kohl's, except a visitor to the Facebook page outed Gawronski as a Kohl's marketing executive. In a reply to one of Ed's posts, the anonymous visitor notes, "Interesting. Ed Gawronski is the VP of marketing for Kohl's. http://www.linkedin.com/pub/ed-gawronski/8/b1b/875 Masquerade much?" Marketing executives certainly have a right to post about their organizations on Social Media sites, but the first rule of Social Media participation is to be completely and totally transparent. This means being honest and disclosing any relationship to the brand. Gawronski, with his chummy recommendation that others furnish their email to Kohl's and his boast about his shoe savings, attempts to pass himself off as a helpful consumer when in fact he is the Vice President of Digital Marketing at Kohls. 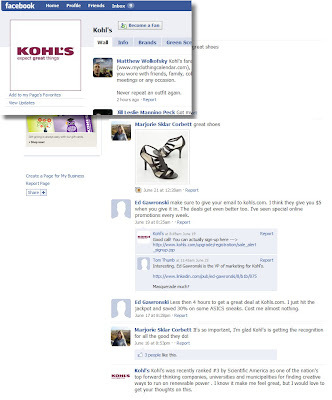 Gawronski isn't the only Kohl's stakeholder posting to the Kohl's Facebook wall without full disclosure. In the last two weeks, Marjorie Sklar Corbett has shared a couple of deals on women's apparel and praised Kohl's for an environmental honor, saying "It's so important, I'm glad Kohl's is getting the recognition for all the good they do!" While I can't be sure Marjorie works with Kohl's, she is a Group Director at McCann-Erickson, Kohl's ad agency; at best, the relationship between her employer and Kohl's ought to be revealed. Social Media is no longer new, and we've seen enough embarrassing transparency mistakes to know better by now. In 2008, a Burger King exec was caught using one of his daughter's online accounts to spread rumors about critical labor advocates. In 2007, Whole Foods' CEO was embarrassed to be found praising his own company and bashing competitors via an anonymous alter ego on finance boards. There are two primary reasons to be transparent and to completely reveal business or financial relationships when blogging, posting, or tweeting. First, getting caught being anything less than authentic is damaging to the brand. It is embarrassing, reflects poorly on the brand, undermines trust, calls into question the objectivity of others participating within the community, and discourages participation by the very consumers whose involvement, influence, and praise is desired and necessary in our increasingly social world. But being transparent in Social Media is more than just a good idea--it's also the law. The FTC has always discouraged false or deceptive practices. It's advertising guides have long required that "When there is a connection between the endorser and the seller of the advertised product that might materially affect the weight or credibility of the endorsement, such connection must be fully disclosed." The FTC is currently considering changes to its guides to demand even more transparency and disclosure in today's more social environment. In a recent MediaPost article, Michael Lasky, senior partner at Davis & Gilbert LLP, suggests, "Agencies and clients, especially those working in the social media space, must understand that the FTC's efforts to address deceptive practices can create liability and exposure." Gawronski and Sklar Corbett's failure to disclose their relationship to Kohl's isn't likely to result in significant brand or legal harm, but they are failing to live up to consumer and FTC expectations in Social Media. They and other Kohl's employees are certainly welcome to participate in the Facebook discussion, but only with full disclosure about their vested interest in Kohl's success. This is a lesson everyone must learn throughout the organization, from the top of the marketing career path to entry-level customer service reps and sales associates: Anything less than total transparency in your actions on Facebook, Twitter, or other Social Media communities can result in very serious, costly, and embarrassing consequences. The way employees and stakeholders should learn this is in explicitly stated and written rules of Social Media engagement and not by being outed in embarrassing and public fashion. Excellent research. You make a great point that the trust social media depends on is quickly betrayed when you learn things aren't as they seem. I hope Gawronski puts Kohl's in his profile and comments here. At this point, I'd suggest to Ed and Marjorie that they consider coming clean in the community. I believe they ought to admit their roles at Kohl's and promise to adhere to more transparency. I'd also suggest they keep posting (with full disclosure) to demonstrate that their desire to participate was real and not driven by a desire to masquerade as consumers. There's a lot to lose when employees stumble through the Social Media landscape without guidance. I would guess this happens A LOT, since social media is so popular, and it's free advertising/marketing. Those of us in marketing hope that it DOESN'T happen a lot. It's really a poor practice (not to mention--as suggested in my blog post--dubious ethically and legally). Organizations and executives caught doing this will pay the price in lost brand trust and reputation! Kelly Reisenbuechler - FB post: " I love my new store in downtown Napa! What a great addition to the neighborhood and the local economy." THE MORE YOU LOVE KOHL'S !" "first off kohl's is not asking there employees to post here, why cant an employee show there dedication and appreciation for their company... Kohl's is great why cant they express that?" "Tomaszewski somehow manages to fit in 18 to 20 hours of work per week working at Genoa Township's Kohl's department store." In Tomaszewski's defense, he seems to be a nice young man. Kohl's is to blame for this deception. Kohl's FB Fan Page: "They dont ask employees to add positive comments! If they did none would "care" to post because most do not have a facebook account. Plus, there is no benfit for employees to post these comments in the first place. "Oh but you get more... people to shop!" simply not the case. shopping is some ones free will and so is posting a positive comment!" "I work for kohls. there is no inact fee! chase is the provider of the kohls charge card. if you have a fee you are uncertain with then call the 1-800 number on the back of your card! we have no annul fee nor done we have any hidden fees. refer back to your card contract you recieve upon approvel! I forgot to include the Kohl's employee's name above; it's Sarah J. Mavis. I appreciate your passion, but I am not interested in having my blog become spot for anti-Kohl's sentiment. My blog post was about a mistake that was made and what Social Marketers can learn from it, but I do not have a beef with Kohl's. I shop at Kohl's, like their selection and stores, and feel the company is by and large well run. I agree with you that Kohl's employees should be disclosing their relationship before posting positive sentiment on the Kohl's Facebook group. Having said that, I think that's the end of this story, as far as I'm concerned. From now on, unless there is evidence Kohl's is directing employees to post (which I do not believe is the case) or otherwise violating FTC rules, I will be deleting further comments that merely report another store employee posting to the Facebook site. I appreciate your passion on the topic, but I also want to be fair to Kohl's as they struggle with the same things other brands are addressing in rapidly developing and changing Social Media. I respect your position on your topic. Perhaps I was confused by your topic, which reads "Transparency (or Lack Thereof) on Kohl's Facebook Fan Page." As you can see, every example provided supports a lack of transparency, whether it be from Corporate, or each store. In fact, the very woman I mentioned above, Sarah J. Mavis, just posted this when someone suggested she was a Kohl's employee: "Who says im an employee? for all you know im playing devils advocate!" As I posted before, she herself announced the day before that she was a Kohl's employee! Lastly, thank you for both blogs, which are truly eye-openers into what companies and their employees are capable of. Thanks for understanding my position on this. I will just add this: If you want to shake up employees who are not disclosing, there may be a better approach than cataloging the transgressions here: Why not reply to them on the Facebook board, point out they may be violating Federal Trade Commission laws governing endorsements made by people with material connections to the brand, and share a link to the FTC guidelines. I suspect that might grab their attention! The company lies, it tells you that you can shop on-line after 12AM EST, 1PM CST time. I go online and the site is down, I tried few minutes later and the site ais working, I tried to checkout and I could not check out. I am posting this strike against Kolhs false aderverstiment on all the blost that find. Kohl's ripped me off. I went to the store to pay my bill for $123.40. Wrote a check for 23.40 and gave them a $100 Kohl's Cares for Kids card They gave me the proper receipts. My next bill arrives showing my payment being reversed and I am billed for the entire $123.40. I wrote the appropriate protest letter and they then found my check and gave me credit for that, but they would not give me credit for the $100 KCK card because I didn't know the serial number! Do you know the serial numbers on currency you spend or gift cards you use? Shouldn't they recognize their own receipts? Kohl's owes me a hundred bucks. Burned in Iowa. Anyone at Kohl's reading this can take it up with Denny at the Ankeny store.